Depending on the different creation myth that you look at, the differences will be slight, but there. Before you look at the creation story, you need to be aware of the most famous Egyptian Gods. 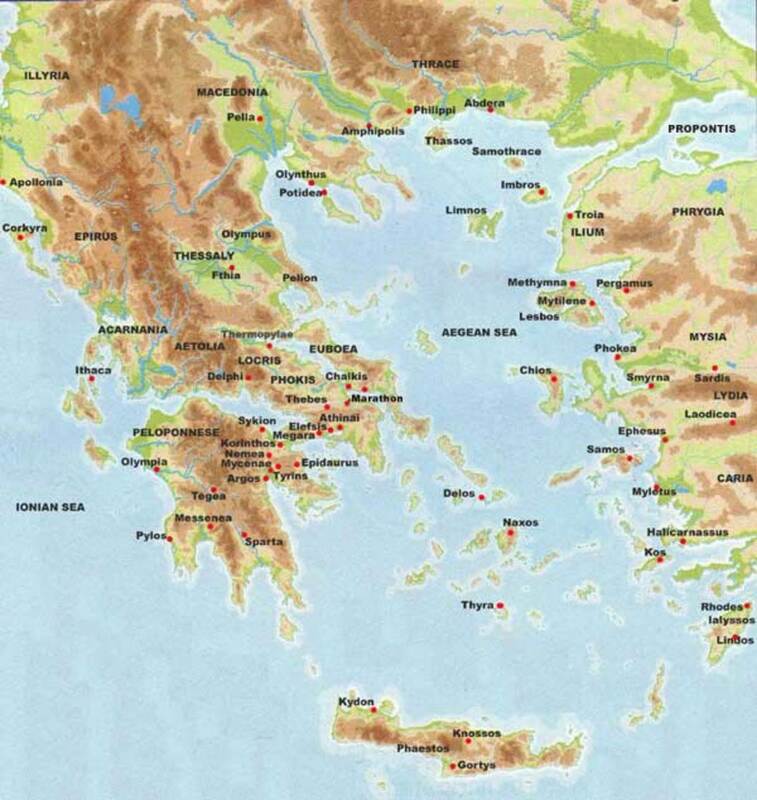 Amon- the chief god of the triad of Thebes; "the hidden one"
Do remember that depending on the area that you look into, the names of the Gods will vary. From the beginning of time, there was only the watery chaos, called Nu. Atum (Amun, Amen), the sun god of the city of Heliopolis, rose up from the chaotic waters with only his thoughts and will. With no place to stand in, except the watery chaos where he appeared, he created a hill. (It was said that the Temple of Heliopolis was built on top of this hill.) With the creation of the hill, it represented the coming of light into the darkness of Nu. Sine he was the only god in the world, he wanted to create more gods, but without a mate he could not reproduce, so Atum made a union with his shadow. This unusual way of producing offspring was not considered strange to the Egyptians. We see Atum as a bisexual god, ans sometimes consider him as the "Great He-She." He gave birth to his son by spitting him out, and he gave birth to his daughter by vomiting. 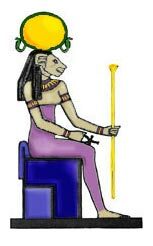 Shu was the son and the god of air, while Tefnut was the goddess of moisture. Shu and Tefnut continued the line of creation by setting up a social order. 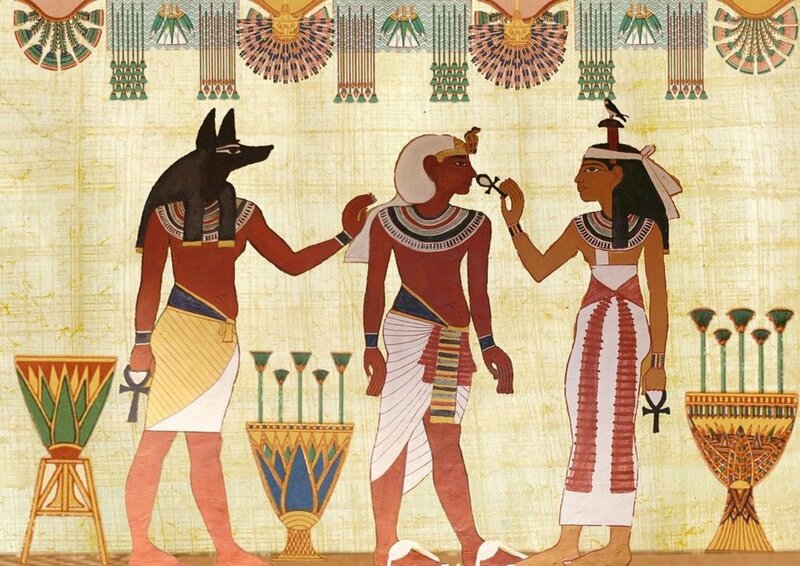 To the order, Shu supplied the "Principles of Life," and Tefnut contributed the "Principles of Order." Some time after their birth, Shu and Tefnut got lost in the watery chaos of Nu. Atum, who had only one eye which was removable. He removed his eye, which was called the Udjat eye, and sent it to search for his children. In no time, the eye returned with the children. Atum wept like a baby with tears of joy after seeing his children. The place where the tears dropped, men came to form. With his children, Atum was ready to create the world. 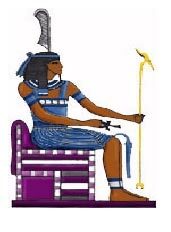 After some time, Shu and Tefnut gave birth to two children, Geb, the earth, and Nut, the sky, who later became the parents of Osiris, Isis, Set, and Nephthys. The sun god, Ra, takes the form of Khepri, the scarab god who was mostly credited as the great creative force of the universe. In a quote, Khepri tells us that in the beginning, nothing existed before him, not heaven nor earth. He , also, said everything came out of his mouth, that he raised from Nu, the watery abyss, to which he, also, created and used the material in it to make everything. At first, he tells us that he had no place to sit, so he cast a spell with his own heart to lay a foundation in ma'at (law, order, and stability). He created everything and was alone. Later, he decided to create more gods, so he breathed the god, Shu (the god of air) and spit up the goddess Tefnut (the goddess of moisture). The sun, which was called the eye of Nu, was hidden. And, not long afterwards, Shu and Tefnut brought their father his eye, the sun. Khepri cried, and his tears became men and women. Later, the gods made another eye, which became the moon. 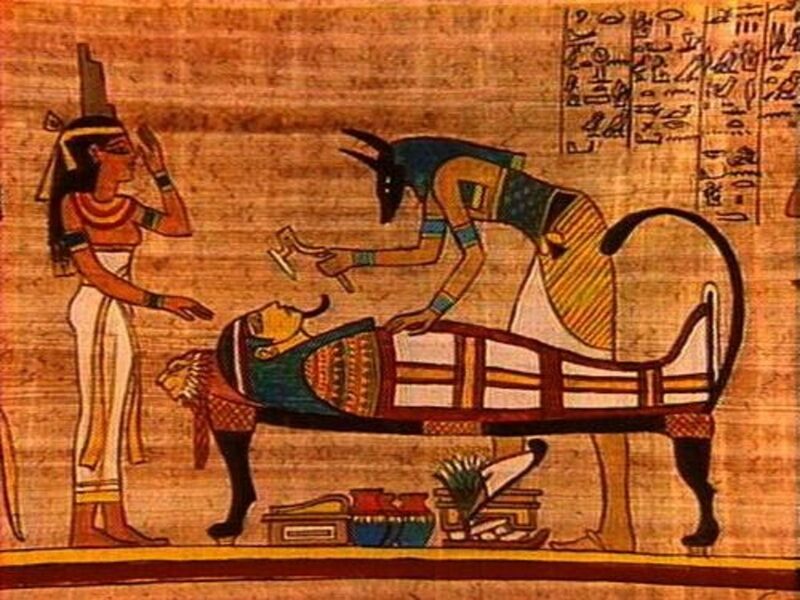 After this, Khepri created animals and plates, while Shu and Tefnut became parents to Geb, earth, and Nut, sky. 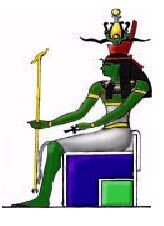 Then Geb and Nut gave birth to Osiris, Isis, Set, and Nephthys. Mythology can be so mixed up, especially when your brother is also your uncle. This is a simple to understand family tree for Egyptian mythology. Find a rather extensive list of the Gods in Egyptian mythology. This alphabetical listing gives you the god and what he reigns over. Osiris's story is actually pretty interesting, if you find being betrayed by your own brother, dying, and being brought back to life by your wife, interesting. Every good myth has it's fights and arguments. Greek and Roman had a number of them. Egyptians have The Great Quarrel between Horus and Set. The Egyptians had a very interesting take on what makes up a man (or woman). There are 5 elements that make up a human. The afterlife was a very scary and hard time for Egyptians, so they kept very strict burial practices that would aid the Ba to its transformation into the Akh. My english teacher assigned a project. We had to find the creation story of 3 different mythologies and I chose Egyptian. We also had to make a quiz. Before I found this site I was looking for one for 3 hours, none of them were informative they all said that there were many creation stories. They also said that there was no spacific story. I started to get mad. Then i found this site, this site was extremely helpful. I had enough information for my notes and my quiz. So thank you so much for the amazing information. Kelly, Egyptian mythology has nothing to do with the bible and this text was correct. This is so way off the mark. Your interpretation is a myth but that is not how Egyptian creation happens. There are no multiple deities, there are different parts of a whole. As stated in Genesis 1:26 (stolen from Egypt) "Let Us Make Man in OUR Image). This would mean even the Bible has more than one God head. Each God is in reality part of the whole. Amen is the Subjective being, without form, in chemistry it is known as black matter. The beginning of all matter from sub-atomic particles to living cells. Because God was without form and void It brought itself in to the OBJECTive realm (sight, smell, sound, taste, touch) and this part of God was named Ausar. Ausar is omnipresent. Ausar is the stage to follow black matter and is every form of matter beyond it. From cells in humans, to the gravitational pull that keeps planets aligned in the solar system. Next is Omniscence, the source of all knowledge and onmipotence, the source of all power (energy is never destroyed nor created, it is infinite) The second stage of creation after Ausar is Tehuti (omniscence) and Seker (omnipotence), this is God at it's highest form in Egyptian creation. Again, as arms, legs, torso, etc make up parts of a whole body, these all make up parts of a whole God. Egyptian creation was originally transcribed by right brained writers, and the misinterpretation comes from trying to translate it using the left brain. The right brain unifies, and creates (as in CREATION), the left brain analyzes and differentiates. That is why westerners (left brain dominate) can not properly translate Egyptian writing and hieroglyphics. It take unification, not differentiation. This is the Father, son, and holy ghost in Christianity. Christianity came thousands of years after the Egyptians and Ethiopians created civilization in the Nile Valley before the Romans came along and stole, then rewrote creation to fit their needs and created the Holy Bible (slaves obey your masters, pay your taxes as it pleases God, etc all found in the Old Testament). Next was the creation of divine law for life to follow and the enforcement of this law and the consequences for breaking it. Stage 4 is Ma'at. The set of divine laws that dictate every eco-system in the universe, from a pond where sunlight creates plankton for bacteria to feed, up the food chain to the mammals, reptiles, fish, birds, and amphibians, to the laws that dictate the distance of planets from their star (Suns) to determine their role in that Solar System i.e. the distance of Earth from the Sun to sustain life without over heating or freezing. 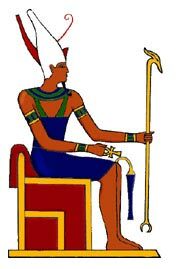 5. is Heruhuti, the enforcer of these divine laws. Should they be broken (man removes a species from the pond, the whole pond suffers because it goes against the laws created by Sphere 4. Sphere 6 is Heru, the creator of the consequences for the breaking of divine law. 4 creates the law, 5 enforces the breaking of the laws and maintains their harmony of them if remaining unbroken, and 6 is the consequence maker for the broken laws. Stage 7-9 is Man.. These are the same as 3,2,1 and 6,5, and 4 in that order but on a smaller scale (see Genesis 1:26). This is Man made in the image of God. If God is an ocean the man is like a drop from that ocean. 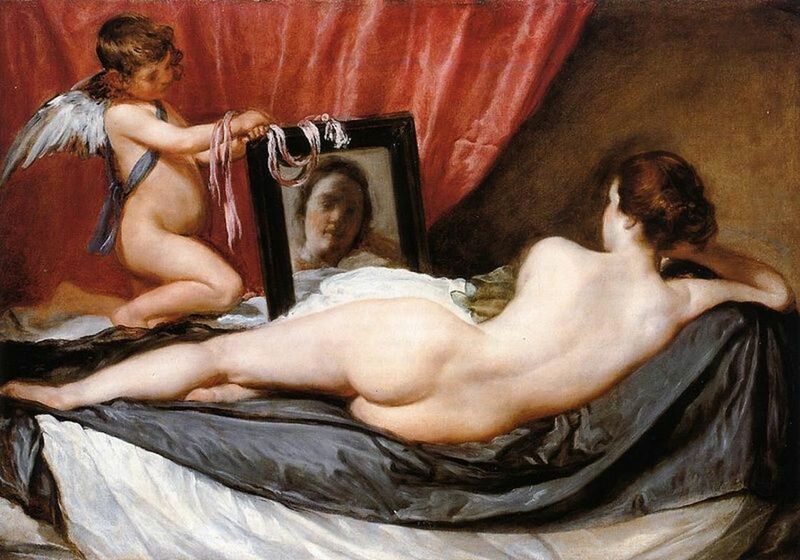 Since it is Man it is mirrored therefore created opposite of God in it's level of spritual growth. Man has the same qualities but not the same quantity. 7 is Het-Heru. This is man's creative faculty (found in the right brain). This is the faculty that creates laws for man, creates architecture, art, etc. Next is 8 Sebek. This is the left brained analytical faculty of man. This is the mathematical, analyzer, differentiation, law enforcement, etc. It comes after Het-Heru because Het-Heru creates the things for Sebek to utilize. Look at it like this. Het-Heru creates a building design, Sebek creates the blueprint based on the information from Het-Heru. 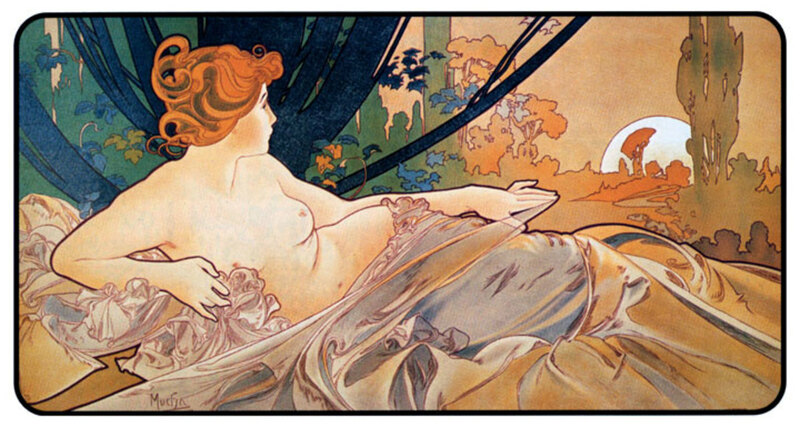 9 is Auset, the most feminine aspect of God/Man. Auset is Earth, Auset is the creator of life. As Ausar 1 was the Creation of God, Auset 9 is the creator of human life. 0 is Amen. 10 is Geb. Geb and Amen are not part of the whole of God in the Subjective realm. Geb is simply the shell to carry around the spirit. There is much more to it. 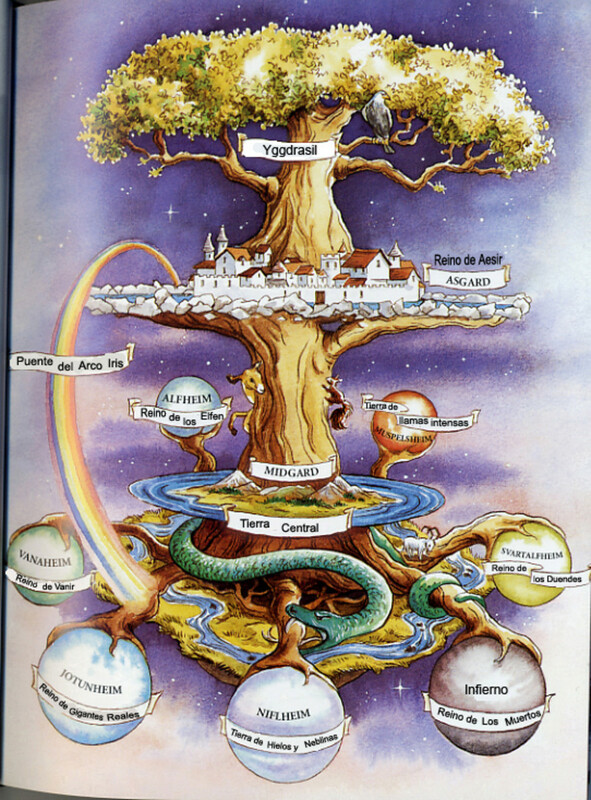 This is a summary but to know the truth behind all of this it makes more sense than any fairy tale in the Bible or Qur'an, the Kabbalah is a twisted form of what I just described. This BTW is known as the Tree of Life. It is the basis of creation and all people are born in 10 physically and spiritually in 9. The goal is to work your way to 1 in human form to become God on Earth. It is done through Meditation (1000s of scientific studies prove meditation, hypnosis, etc to be effective at changing a person while there is zero data to back the power of prayer except mere coincidence). This is not a myth. This is backed by science. Astrology, cosmology, physics, chemistry, etc. I would consider more research before spreading information that is incorrect. very very very hepful for my Egypt project thx!!!!!!!! you have no idea how helpful that was thanx! I thought this was very very very helpful thanks!!! Very helpful, thank you. Finally a shortened verision of the myths. hate history but this was interesting and helpful for my english project!!!!!!!!!! !